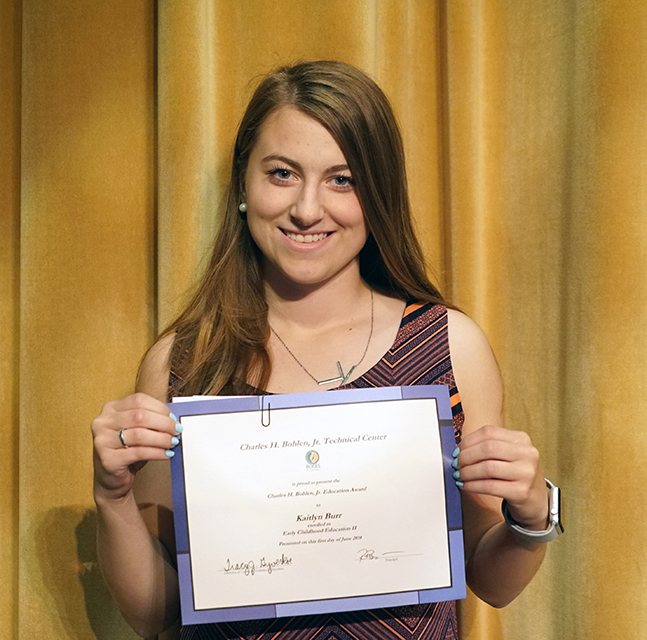 A recent graduate of the Early Childhood Education program is nearing completion of her first year of college and is crediting her time at BOCES in helping prepare her for a future career path. Kaitlyn Burr is a 2018 graduate of Watertown High School and is currently enrolled at Buffalo State College where she intends to major in Speech Pathology. Her goal is to become a Speech Pathologist, working with infant to Pre-K level students. She discovered this particular career path during her time at BOCES. Kaitlyn says she knew right away that Early Childhood Ed. was a perfect fit, giving her an edge when applying to college. She says the internship opportunities were her favorite activities at BOCES, citing the different settings and age groups that she learned from. Kaitlyn also says that she found herself well prepared for college when she began taking courses in the fall. Kaitlyn says the amount of experience you gain is reason enough to enroll in a Career and Technical Education course at BOCES. The Early Childhood Education program is available at the BOCES technical centers in both Jefferson and Lewis Counties. To learn more about the program, click here.